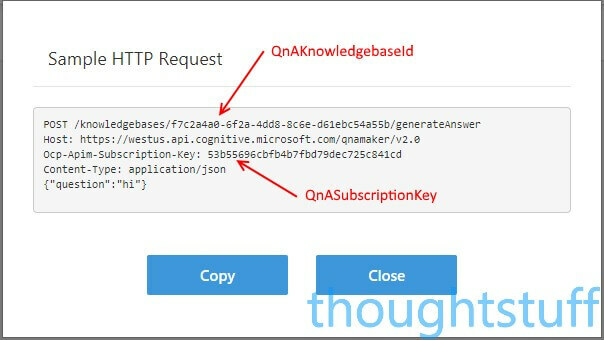 In part 1 we created a Knowledge Base with QnAMaker, and in part 2 we built a bot using an Azure Web App Bot. Now, in the final part, we need to connect those two things up together and then explore how to expose our bot by embedding into a website and setting up Channels. Notice the two values at the bottom don’t have values in them? That’s what we need to provide. 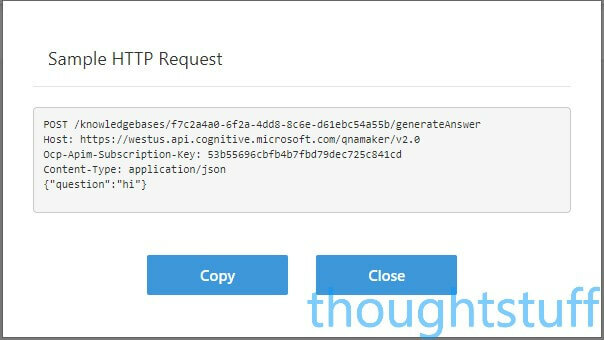 Now we have a working bot, accessible via the Azure dashboard. Now we need to make our new bot available for everyone else to access. This page shows all the enabled Channels. A channel is how users will interact with your bot. 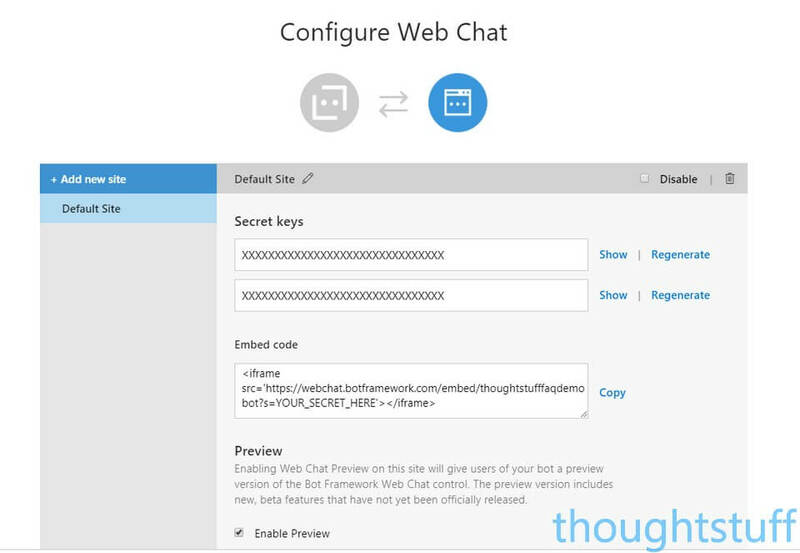 The Azure Web App Bot can work with a number of different providers, such as Facebook Messenger, Slack, Telegram, Skype for Business and Microsoft Teams. This gives you the embed code you need to add your bot to a website. However, you’ll notice that the embed code includes a section, which says YOUR_SECRET_HERE. You need to replace that with one of the two Secret Keys, which are hidden until you click the Show button. Click Show, copy the code, paste it over the YOUR_SECRET_HERE section and then your embed code is complete. Once you’ve embedded your bot into a webpage, you can think about offering it in other channels. 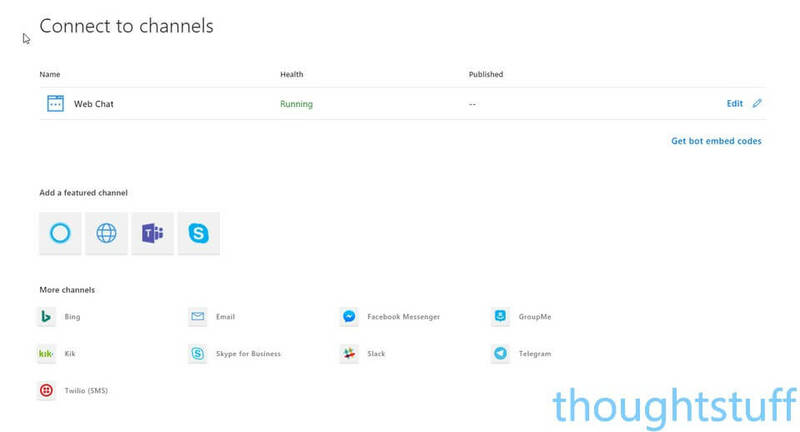 Each of the supported channels has a different onboarding experience. Some, like Microsoft Teams, are really easy. Others like Skype for Business require you to run some PowerShell on the tenant to authorize the bot. 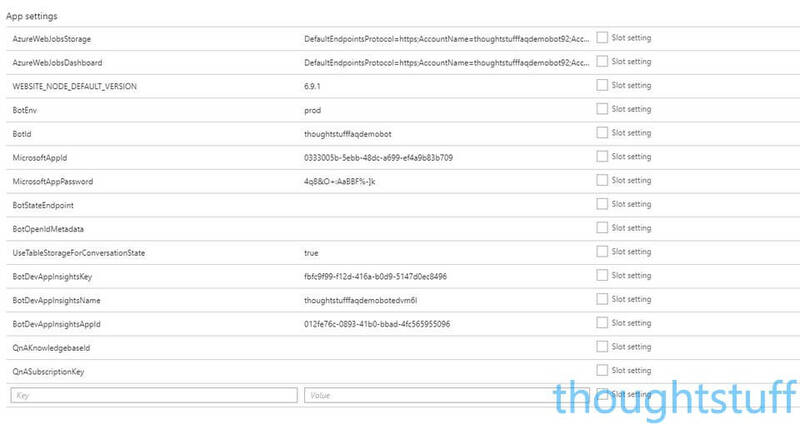 Others still, like Facebook Messenger, have a more complicated setup, involving registering as a Facebook Developer and gaining a developer key. However, the Web App Bot will walk you through the process, telling you what’s needed and where to go in order to find the information you need. If you’ve just run through this guide then it’s worth pausing and considering just how much you’ve accomplished with relatively little effort. A bot, with artificial intelligence and machine learning, a configurable Knowledge Base of answers, accessible via multiple channels, without writing any code. This was not possible a year ago and was unthinkable 5 years ago. It’s a testament to the effort which Microsoft has invested in making complicated but important functionality easily accessible. This means that anyone can now build intelligent bots, and that can only be a good thing. I’m excited about the future. Now, what are you waiting for? Go and #DaydreamDevelopDisrupt! Useful Post? Why not subscribe to my weekly newsletter of blog posts to make sure you don’t miss anything. This will include any new how-to series that happen in the future.